After three thousand years spent between the desert dust and museum cases, the sarcophagi conserved at the Musées Royaux d’Art et d’Histoire in Brussels, at the Cinquantenaire Museum, were due there turn for some restoration. The Belgium Royal Family owns the exhibit, and could have chosen any company in the world to undertake this delicate task. They chose an innovative all-Italian laser technology , called ‘the thunder art’ which is produced by Quanta System, the Italian company and part of the multinational El.En, a world leader in the production of lasers for aesthetic medicine, surgery and art. The restoration of five sarcophagi recovered in Egypt in 1891 will be carried out in an innovative way: while the work is in progress the public will have the chance to watch via online streaming. 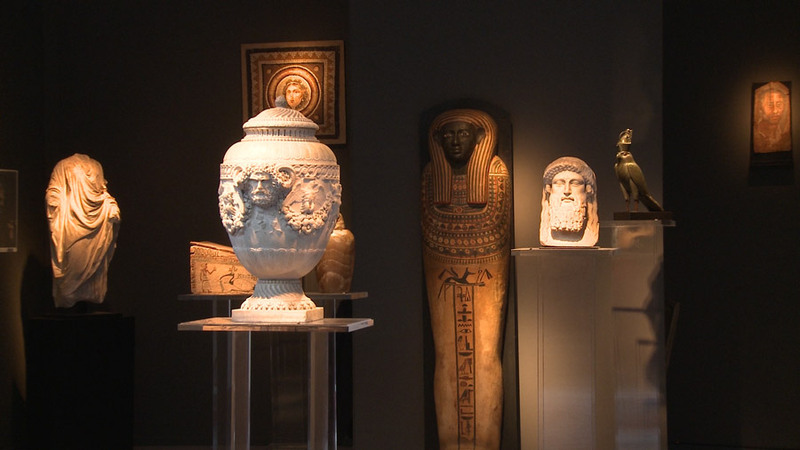 The five sarcophagi from the XXI Dynasty of the Egyptian collection, will be on display until April 20, 2016, at the Royal Museums of Art and History in Brussels. Visitors too will witness the work of the Italian restoration team, lead by Teodoro Auricchio, Director of the European Institute of Restoration of Ischia, Naples, as they restore the coffins with the Made-in-Italy laser technology Thunder Art, that allows great precision, selectiveness and respect for the original surfaces. “I am proud, as an Italian, to take abroad the know-how developed in our country, together with Professor Alessandro Zanini, Responsible of the Light for Art Division of El.En”, says Paolo Salvadeo, CEO of Quanta System. 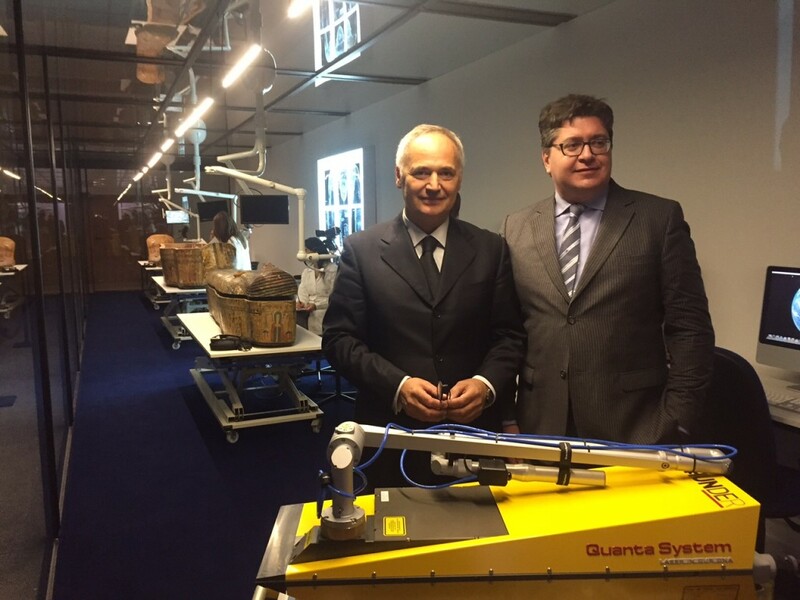 “We are proud to be, with Quanta System and the Light for Art Division of El.En, the global leaders in the production of specific lasers for restoration of works of art, using the same Q-switched technology deployed in the medical field. Whether it is restoration of works of art or medicine, we have at heart the same principle: we take great care of people and masterpieces”. “We are very proud that the Thunder Art has been selected for such a prestigious order and we are confident that Prof. Auricchio’s team can achieve, as it has in past assignments, top-notch results in the restoration work”, says Prof. Leonardo Masotti, chairman of El.En’s Scientific Committee. The Brussels’ restoration follows the same procedure that has already given excellent results in 2007, when a team lead by Dr. Auricchio applied the Quanta System Q-Switched technology on the surface of an extremely rare Egyptian sarcophagus of the XXVI dynasty at the National Archeological Museum of Parma. “Today, thanks to the latest generation Thunder Art laser, we expect even better results”, says Dr. Auricchio. Prof. Teodoro Auricchio, direttore dell’Istituto Europeo del Restauro di Ischia ed il dott. Paolo Salvadeo, amministratore Delegato di Quanta System del Gruppo EL.EN. Spa. Thunder Art is a patent of Quanta System, founded in 1985 in Solbiate Olona, Lombardy, and owned by El.En. Group since 2004. El. En. Group, founded in 1981 in Florence, is the leading company in Italy and among the leaders in Europe for laser technologies. The European Institute of Restoration of Ischia is a center of excellence for heritage conservation and restoration. Starting next December, a team of the Institute will use the same laser technology deployed in Brussels on a 16-century chapel in the Aragonese Castle in Ischia, that hosts the Institute headquarters.